Random query time. I have a few founders jewels which I need to convert to PM ones. I have heard it can be done but unable to find anyone that actually does it. Do any of you know of anyone that can undertake this type of conversion work ? 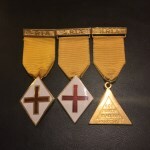 The Lodge I am a founder of had a small ring at the bottom on the back so that if any went on to be Master, we could hang the 47th prop from it. I'm a founder and a PM - give me day or so and I'll find out who does ours. I think Paul Clement of the South Wales Regalia can do this kind of works, maybe you could give him a ring? W.Bro. & V.W.Fra. Ben. C.
Spoken to our secretary ; he uses Toye, Kenning and Spencer in Birmingham for the conversions. Last edited by Richard George on Mon Mar 05, 2018 2:44 pm, edited 1 time in total.